There is a tendency when purchasing watches to go for the elaborate — the same can be said of anything, really. The mentality is that the more bells and whistles something had, the more impressive and expensive it is, the better it must be. However, this not necessarily to everyone’s tastes, and a high price tag doesn’t always translate into quality. While there’s nothing wrong with big and flashy, some folk prefer a more minimalist approach to their watch aesthetics. Some folks just like things to be simple and understated — they believe that less is more. Indeed, it’s a style that’s been highly influential in the past few decades, exemplified by the sleeker, more streamlined models of cars, or the very modern designs of Apple products. It’s also reflected a great deal in modern architecture and interior decorating, with an emphasis more on simple, blocks and colored shapes rather than more complicated, intricate designs. Another reason people may wish to go minimalist is for the utilitarian design. Plain watches can get you just about anywhere, and are very good as a reliable, multi-purpose accessory. A minimalist watch can work just as well on the job as it would in more or less formal settings. The same cannot be said of watches with elaborate designs or lots of additional features, which would place them more firmly into certain functions. Larger dive watches, for example, have a lot of bells and whistles that you might need when you’re under water, but those clunky designs with all the extra knobs and buttons would be unnecessary and out-of-place anywhere else. If all you need is the time and date, you don’t want to have to dig through a bunch of extra functionality to see it. 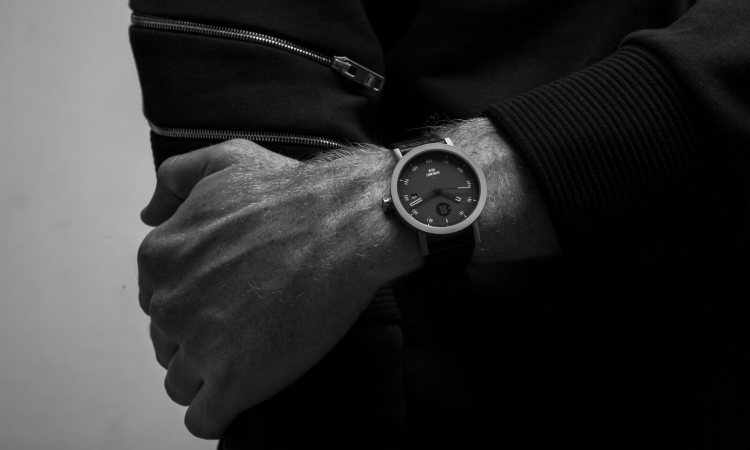 Finally, because they’re not as elaborate, minimalist watches also tend to be cheaper. This is not a hard fast rule, but it’s often the case that the lack of additional features and decoration will keep the price down, since you’re not buying more watch than you need. So what do you look for in a minimalist watch? What sort of brands should you look at first? We’ve got the short list of minimalist watches and brands for everyone who likes to dress up by dressing practically. The first of our selected watches, the Minus-8 Zone is described as being the “stripped down soul of Minus-8.” It’s possessed of simple architecture and smooth textures, and the watch showcases its own high-quality and durable materials rather than adding a bunch of gaudy accents. It’s a simple watch that is hardy enough for daily wear so it can keep doing what it needs to do — tell the time. One of the pricier items on our list at $280, the Vestal ZR2 features a bulkier design with a chain-link strap and a bold black face. It’s a somewhat larger design than the Minus-8, retains a simple design that can fit in almost any setting. The simple analog chronograph is easy to interpret with a clean dial, and the stainless steel link watch band completes the look of a watch that makes a statement, but without a megaphone. After a large array of silver watches, here’s a very slimming black watch for the list. With a black stainless steel case and a leather strap, the Braun offers a traditional no-thrills aesthetic that, again, fits comfortably within a casual or professional or formal setting, while sacrificing none of its functionality or the necessary durability for an everyday wear watch. It’s hard to get any more minimalist than this without a sundial. The watch is completely plain and devoid of all marking and decoration – it doesn’t even have numbers. The sole decoration is the face itself, which features a distinctive twelve-sided shape. It’s not only pretty nice to look at, but each corner also functions in lieu of the traditional hour markers. The result is a casual wear watch that is not only striking to look at, but also very strong and confident in its design. While certainly more expensive, the Issey Miyake TO is also worth a mention for those in love with minimalist style. Like the Ladies Twelve, the TO has a very simple design — seemingly fashioned from a single piece of steel, with notches around the watch face to mark the hours. It is also notably larger, with a 43mm case in comparison to the 28mm Ladies Twelve, but similarly projects a sense of confidence and style — raising eyebrows without halting traffic.